Last October, I promised that I would be smarter. Tired of feeling somewhat stagnant in my training and racing, with nothing much to lose since I hadn't been improving much, I decided to move away from the concentration on loads of easy mileage and tempos. You can read the linked post for details, but basically instead of thinking of my training in terms of maximizing work, I decided to think of it in terms of maximizing the right kinds of stimuli. I also have been working with a coach to get some distance from my own training and basically give me the confidence I needed to trust my training, to back off at times and to push harder at the right moment. Since then, I've been running less (50-60mpw, no runs longer than 10-12 miles) and doing different sorts of workouts, with an emphasis on practicing fast paces rather than the kind of heavy aerobic tempoing that I'd been doing in the past. This training has worked well for me. I feel sharper and more race-ready when I get to the line. I spend very little time grinding on tired legs. I've got more energy during the day and more excitement about racing. Sure, I kinda screwed up my first indoor race by freaking out about the intensity of it all. But Friday night, in my second indoor race, I was able to run 15:51 for 5k off of an opening 4:53 mile (I was in a faster heat and came through the mile in last place!) Though I ran 15:49 on an outdoor track in June of 2010, this was at least an equivalent performance. And--this is the good news--unlike in 2010, I don't feel like I am training at the limit, and I am hopeful that I can take more time off this spring. As you know, the point of this blog is to try to do some meta-cognizing about running and training, and the philosopher in me is tempted to draw general conclusions from this small success. I could make some sort of statement about how intelligent training is better than just training hard. Part of me wants to write a controversial piece about how maybe all of this hoopla about high mileage is overblown. My own pride wants me to think that I've made some real breakthroughs and have actually gotten smarter and know more about the right way to train. Heck, some of these things may even be true. I don't want to go there, though. I'll leave the training advice to the actual experts for once. I am less interested than ever about being right about training. Or being right at all. I want to talk about something else. Today I ran the most intense workout I've done in years. It was simple and short: 2 x 2400m cutdown, each 800 slightly faster than the one before. The last 800 of each piece was hard, and it put me in this mental place that I had kinda forgotten about somehow in the grind of training, over the last few years. I'm not sure I know how to describe this place, so bear with me a bit. Maybe the best way to get at it is to begin where my bad race left off, with the discussion of fear. That fear came back in the middle of my 5000 on Friday, but I reacted differently to it. I was able to acknowledge it, then ignore it, and just keep running. I was indifferent. That's the space I am talking about. I guess the word we have for that indifferent space is "confidence." I hesitate to even use the concept of confidence because it is a word that is overused and under-analyzed. Confidence is not about ego. It's not cultivated through attention and praise. Its most basic meaning is simply "trust," as in the expression "take someone into your confidence." This indifferent place I went today in the workout, the place I found in the middle of the race on Friday, was a place of trust. Even if it hurt and although the effort was hard, I simply trusted that I could keep going, that I could execute. These last four months of training and racing have been--more than anything else--about developing this trust, believing not just that I can train harder (anyone can do that), but that I can race faster, that I can be faster. If we want to give birth to new capacities, if we want to make ourselves anew, if we want to become better than we were before, we have to put in the work, that's for sure. But that hard work means nothing without the confidence to reap the results. In fact, the work can even blind us to our own power of trust--we want the work to make us faster, when actually it is something else that shifts things. Although the elites can make it look easy, running faster is never easier. We get in better shape, sure. But what that shape allows us to do is to reach higher levels of intensity and to sustain them. It's never easier. It's harder, even if you are fitter. But if you want it enough, if you are fit enough, if you are strong enough... if you trust yourself enough to handle all those multiplying ifs, then something happens. The shift is this: it is harder, but you are tougher. So you take it. I think sometimes we need slower, high-mileage training, and sometimes we need faster, low-mileage training. Getting better requires doing the right kind of training at the right time. What's "right" is going to depend on the bajillion factors that make up your life. I don't get why runners think they have to owe allegiance to one method or another. Maybe it's because constantly mixing it up totally destroys any illusion of control; it's an admission that there is no real order in life. Great performance, by the way. Hey thanks, Josh. Why do we get dogmatic about anything and everything? A good question for philosophers and psychologists. I know you have been dealing with that as well in your barefooting experiments. It seems to me that whenever anything new comes on the scene, we oscillate between extremes and slowly--usually too slowly--experience and reflection lead us to the practical. Perhaps there is this tendency to extremes because trying something new takes courage, and thinking of what we are doing as *extreme* kind of gets our juices flowing enough to try it out. This attitude may be helpful at the beginning, but turns out to perhaps be harmful later. Hope your running is going well! I think there's also a bit of an effort to be scientific involved in our extremes, an attempt to put some controls in place. If you do a little bit of everything, it's tough to know what helps and what hurts. But I think life is too chaotic, and any patterns we see are just what we want to see. I like the idea of training for confidence, and letting the fitness just happen as it will. Train for what you're worried about. Crap, this was going to be a post on my blog. You started this about the same time I was having some of my own thoughts on how I've been training; was I getting stale? Am I "soft", when was the last time I wanted to puke after a workout?.. stuff like that. Keep up the good work and keep us posted. Exactly, Wade. Are you thinking about racing when you are training--or are you going through the motions? On work out days I think about racing, on recovery days.. who knows where the mind goes. "put me in this mental place that I had kinda forgotten about somehow in the grind of training, over the last few years." That really spoke to me. For me I just have/had to get out of my "marathon mind" where I'm like Pacman trying to gobble up each little extra mile I can during the week. I do better when I concentrate on the workouts and the purpose of the workout and don't try and milk every day for miles to stick in the training log. It keeps me from doing an easy 10-12 miles (gotta pump up that weekly total!) instead of a tougher 8. Right--for those of us who have been at this game for a long time, the very habits that made us good: consistency, relentlessness, etc. can become problems: stubbornness, lack of responsiveness, etc. I know you had some setbacks lately, and those also likely gave you a chance to refresh yourself. Hope to see some good races from you this summer. 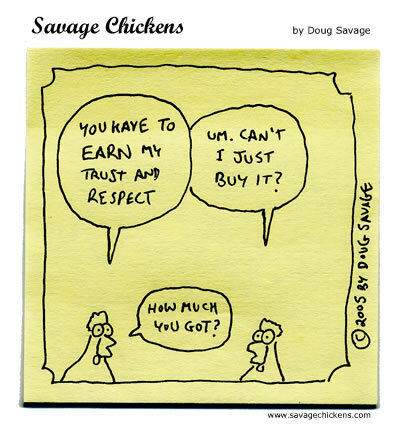 do you think you can transfer that self-trust from one thing to another? like, if you trust that you can... oh, i don't know... if you are smart, you have good study skills, and you test well, so that you excel at academic pursuits, then you would trust that ability in yourself. can you take that self-trust and apply it to running? or, if you are a confident runner, can you transfer that to academics, or to work? seems that it's generally accepted that athletic self-trust can be transferred to other aspects of life, but you really don't hear about confidence going from another type of success into athletics. I don't know about that. I do think that I run well when my life is going well in other respects. I also lean on running when the rest of life is going badly. So, that's a mode of transference from one arena to another. I was watching Jeremy Lin today--the Knicks point guard who is coming out of nowhere to become a dominant player. The reporter asked him what the difference was this time, this year, vs. all the other years. He said that before this year, he had focused on fitting into his teams and into the NBA. He was an intelligent guy trying to adapt himself to the league. This year was his last shot, he knew that, and this time he went into it with a different attitude. *He wanted to go out on his own terms, playing his own way. * He made the decision to trust himself--it made all the difference. I guess I can relate to that. I share Ace's question. I was talking to my husband about this the other day. I love books, and I have utter confidence in my ability to separate the wheat from the chaff when it comes to great books. I like to spar with people who disagree with me on a particular book's merit, because the reasoning behind my opinion has been *confidently* thought out and (to put it bluntly) I know I can take 'em. But I am *not* this way in many other things, and running is one of those things. I love running. I have a lofty goal. I read a lot of blogs that talk about confidence being key. But all those kinds of posts do is make me anxious, partly because they make it sound like you're doomed if you *don't* have confidence, but also because unlike a training schedule, there's no set system for building confidence in one's ability to "take 'em" in running. Other than running a bunch of races (not all of which will be confidence boosters), I don't know how to train for confidence. I don't know if I'll ever have it as a runner. Well, a huge step for me has been hiring a coach. I've been meaning to write more about this on the blog, but I've actually avoided the subject *because* it's been so central to my success this go 'round. I guess I am superstitious, and I don't want to overanalyze that aspect of it all. I've been really lucky to work with some really top coaches at both the high school and college levels, and the primary thing that they do as coaches is instill confidence into their athletes. They show their athletes who they can be, and they listen to and affirm their athlete's goals. Having those lofty goals made objective by someone outside of you with expertise in running--having that person say, "Yes, you can get there, and here's how..." is so huge for an athlete. Then, of course, that plan has to be re-affirmed through workouts, races, etc. This is the art of coaching--getting people to trust themselves and achieve their potential. I imagine that if you think back to how you earned your confidence in your intelligence and intellectual taste, you will be able to pinpoint a professor or a relative, a set of friends, or a set of experiences that gave you positive and ongoing feedback in this area. We don't need everyone in the world to affirm our projects, but we need a few good people that we trust on our side. To me that's the huge thing that builds confidence. i'd be interested to know how many people, in the general population, are highly confident both intellectually and athletically. i would bet it's few because it's not how we're raised. you're either a jock or a brain, and although you CAN BE both, you're rarely ALLOWED TO BE both. (of course, you could be neither.) i was raised to be a brain and got a TON of support there. athletics was something to do for exercise, for health, for fun. if i had naturally excelled, i am sure i would have received support, but being naturally mediocre in sports but excellent in the classroom, that's the support i received. hence, my confidence is in my brain, not my body. In a variety of places on this blog, I've talked about intelligence in terms of acts of attention. Our identities are constructed to attend to certain aspects of ourselves; they amplify those aspects, and then we care much less or don't even notice other aspects. We have a whole narrative of self-care and self-actualization that is funded by really deep habits of thinking about who we really are. So, in writing about confidence, maybe what I am writing about is a way of constructing a different habit of attending to the self: breaking old feedback loops that reinforce certain outcomes and investing energy and time into constructing new loops. This is a sorta fraught process because--especially as we get older--we find comfort in the old habits of perceiving the self. If they cause us damage or limit us, at least they do so in ways that we already understand and can process.